Team 291 proudly presents our 2018 FIRST Power Up robot! Click here to watch the reveal video! Let us know what you think of our robot! Feel free to ask questions or comment on what we can improve! Looks awesome. I really like your intake and arm, and how you integrated the two. In addition to your grip, do you have anything else to ensure the cube doesn’t fall out? Overall, really good job, 291! Looks awesome. I really like your intake and arm. In addition to your arm’s grip, do you have anything else to ensure the cube doesn’t fall out? Wow. Great work guys. Love the intake mechanism. To improve the bot in the next 10 days, you could potentially look into and add a climbing mechanism on the arm, as long as you set the arm up to hold your weight. Thanks! We actually did leave room and weight to climb. The arm was designed to hold the weight with a winch to actually lift the bot, but now we are thinking we will deploy the hook and have it detach from the arm. We will see what works best! We wanted to focus on getting cubing really good and finishing early before we spent any time on climbing, as we are a small team. It’s all about knowing your own limits! Also 449, you guys helped me a ton last offseason to get motion profiling and path planning working. We just got our “far side” scale auto working today. (meaning we start on the left and get it on the right side of the scale or vice versa). Will post videos soon!! Thanks! See you at competition, and week zero! The robot looks great! Looking forward to seeing it up close at Miami Valley. I definitely like the double cylinder usage on your wrist. You guys are coming to Pittsburgh this year? I thought you were going to Districts instead? Also, so you at Week Zero! Thanks! A ton of time was spent getting the three wrist positions just perfect for the different heights with the geometry of the rest of the arm. The lowest wrist position is for quick dumps when the scale is low, the high is for placing over a cube when the scale is high, and the middle is for everything else. Looking forward to showing it to you! See you there. Unfortunately we aren’t coming to Pittsburgh but I’m looking forward to seeing you guys at week zero! I really love this robot. It’s been awesome seeing you guys improve the past two years in the off-season at Ruckus. Good luck this year, and hopefully we’ll see you in Detroit! Great robot and music. Now I wish we were competing against you, but you never know who you’ll play against or with at worlds. Just yesterday FIRST Updates Now featured our reveal video!! Click here to watch their analysis. I also had the privilege of going on live to talk last minute about it after the giveaway! Thanks FUN!! -We have no problem picking the bottom cubes out from the pile (we just need to pick out the bottom ones). It works best if we approach from the corner of the cube. -Picking up against a wall works even better than out in the open. 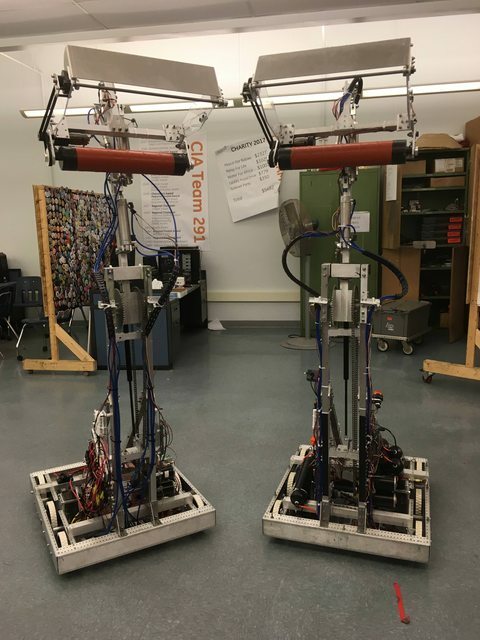 -As of now, we have no plans to add a climber for week one, but we are planning to add one for buckeye as we can test it on our practice robot. Stay tuned! -We are well aware of the launching rule and have two different buttons to eject the cube. One very gently spits it (we will use this most often for accurate placement once the scale gets crowded) and then there is a trigger to spit anywhere from 50% to 100% power, and that is what you saw in the video. Let me know of any questions or comments! Also, if anyone needs help controlling their robot’s arm (these things are tricky), I am more than happy to help you make it just as snappy and accurate as our arm! Just let me know. Our competition robot, Tau, is now cozy in its bag waiting for week 1! It’s twin now gets it’s turn to have all of the attention :p. We had a ton of fun at the girls of steel week zero last Saturday (thanks 3504! ), and got to try out some of our two cube automous modes! Check out a video of our two cube switch auto! See you at Miami Valley!